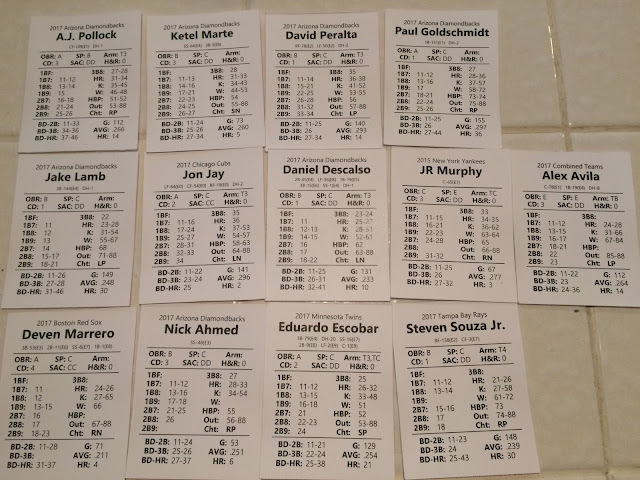 Each game of the World Series using 2017 Statis-Pro player cards with roster updates from 2018 is summarized below in reverse order. Spoiler alert - an incredible season and playoffs comes down to a Game 7 between the Indians (whose cards are from last season when they had the best record in baseball plus the addition of former MVP Donaldson and ace reliever Hand) and the Diamondbacks who had the 3rd best record in the NL last year and added the best rookie reliever in 2018 in Yoshihisa Hirano and the 2017 cards for playoff players Jon Jay (Cubs in 2017) and Eduardo Escobar (Twins). 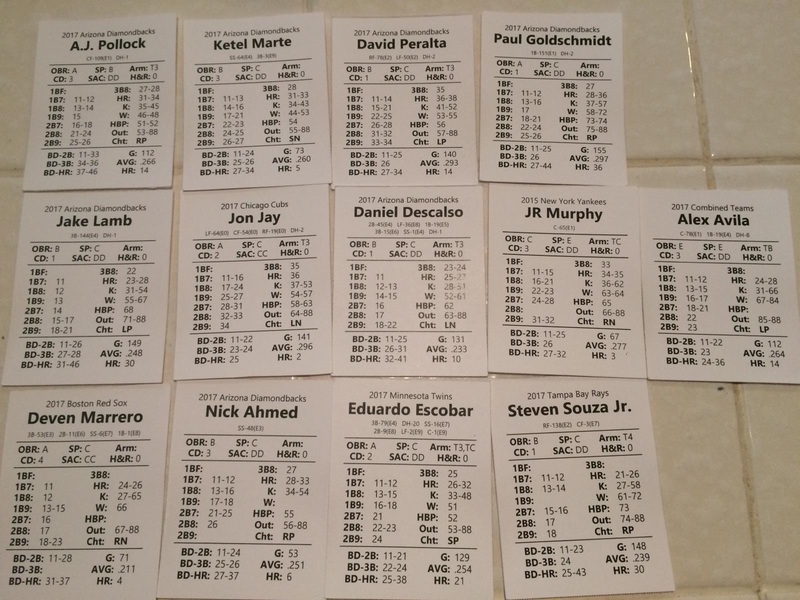 Learn to play Statis-Pro Baseball in 5 minutes by clicking here. Corbin continues great work. Indians get 3 shutout innings of relief from Kluber. Olson with a scoreless 6th. Now will they have enough arms? Tension building we are still tied 1-1 after 6. In the 7th, Rajai Davis lead off 2B, wild pitch, at 3rd, no outs. Corbin gets a K, then Hirano gets 2 more. No real threats in next 2 innings. Game 7 is headed to extra innings. Indians down to just two pitchers left. In the 10th, Pollock triples, Marte with the RBI single, and Peralta with the crushing 2-run HR off Hand. Bradley closes it. 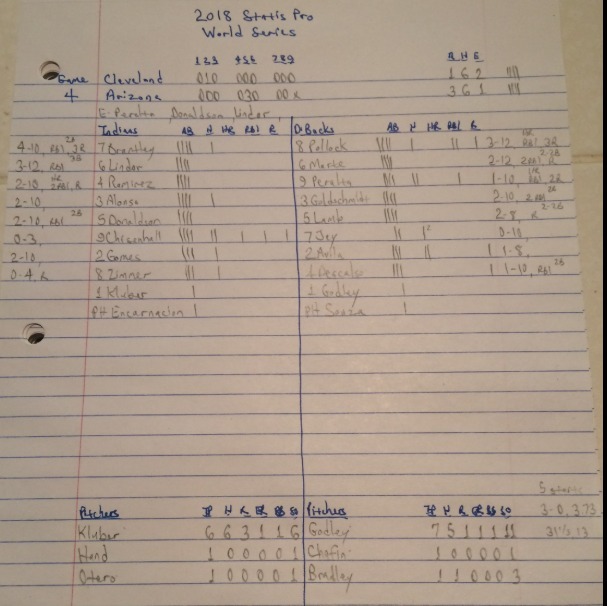 The unlikely 2018 Statis-Pro champions the Arizona Diamondbacks winning game 7, the final 4-1, in 10 innings. 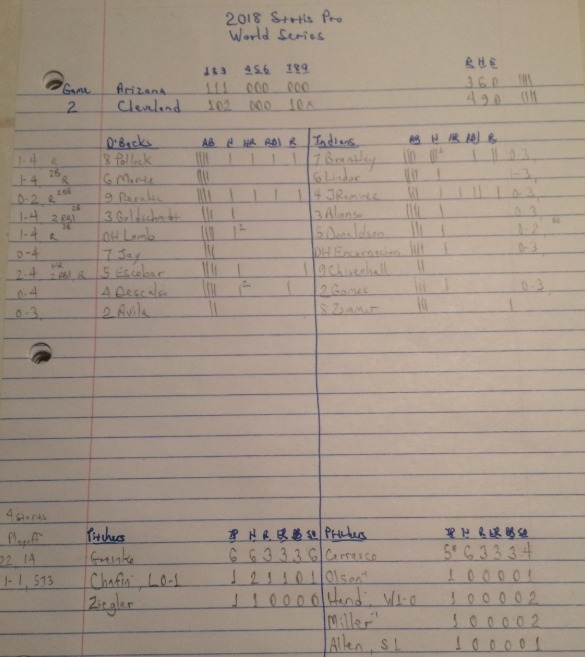 And so the Cleveland Indians, using cards from 2017 plus two superstar additions, fall just short to the Diamondbacks team that likewise added a pitching and hitting star (Twins Eduardo Escobar and rookie Yoshihisa Hirano) from the AL 2017 cards that produced the second best run differential in the AL with a +153 before falling to one of the hottest teams in history in the LA Dodgers. The Indians were extended to seven games by the Yankees which meant our AL Statis-Pro Cy Young award winner had to pitch that game and could only pitch Game 4 of the World Series. However, because we play pitchers can relieve three games after either pitching to 12 batters or starting (or relieve two games after pitching two games after facing 6 batters in relief) Kluber will be available to come into relief with an RR 6 during Game 7. A quick recap, pitchers have one of five ranges by their PB; 2-9 means elite top 5 percent of pitchers, 2-8 meaning one of the top 15% of all pitchers, PB2-7 meaning strong, PB2-6 meaning mediocre, or PB2-5 meaning poor. While the Indians do have their weakest 2017 pitcher card starting in Trevor Bauer who was only a mediocre 2-6, and four pitchers are not available, that still leaves the Indians as perhaps the best bullpen ever available in Statis-Pro with four PB2-9 pitchers guaranteeing they can pull Bauer at any early trouble and their other pitcher is closer Cody Allen as a PB2-8. The Diamondbacks have an edge in lefty starter Patrick Corbin who is a PB2-7, and they did not need to use any relievers for 6 batters or more in Game 6 so only their Game 5 and Game 6 starters (Ray and Greinke) are not available. They do have eight pitchers, though they only have one PB2-9 to the four the Indians can bring in, and they do have two PB2-8 pitchers and three PB2-7 pitchers available, so there is little chance they would need to go to a PB2-6. 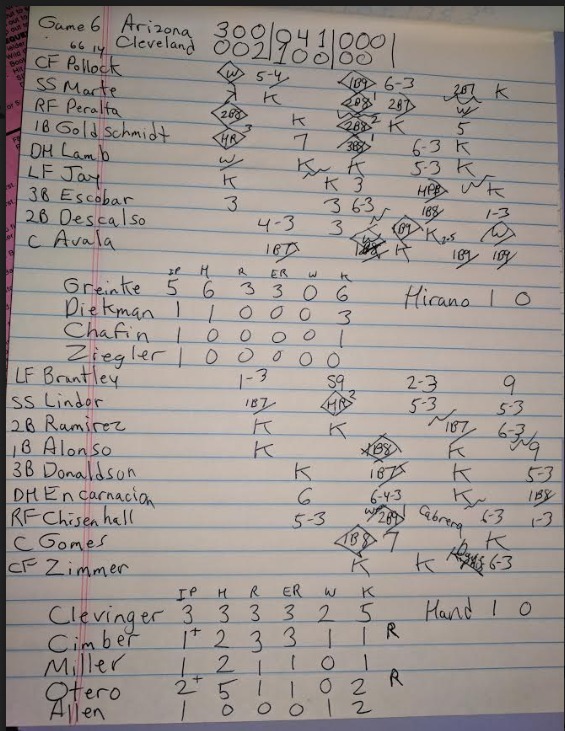 On the brink of elimination, Goldschmidt came through again with a 3-run homer in teh first, and then added a triple off Andy Miller to cap a 4-run fifth inning in an 8-3 win that forced a Game 7. Peralta doubled ahead of him both of those at bats. Greinke gave them five decent innings for the win, and that allowed them to let four different relievers go an inning each to have the whole pen and Game 4 starter Godley all ready for Game 7 if needed. While errors are less and less frequent in modern baseball, the Diamondbacks repaid the Indians charity in Game 4 by committing three errors, two of which led to runs that were the difference in a 4-3 Indians win. Donaldson was the hero of the game, driving in all four Indians runs on three different hits - but twice those hits came after Lindor reached on errors. He hit a two-run homer in the third that looked like it might be the game winner, then added an RBI double in the seventh to make it 3-1 after Lindor reached on an error on a grounder to second and then raced home from first just head of the tag. 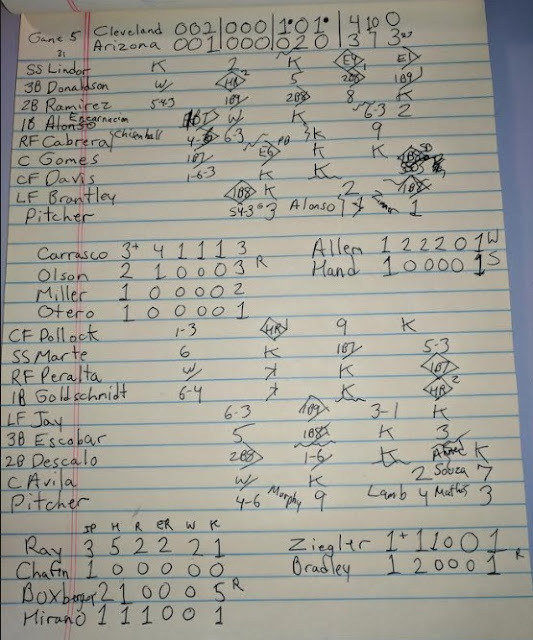 However, Goldschmidt's 2-run bomb off Cody Allen tied the game 3-3 in the bottom of the eight and the Indians were running out of pitchers if the game went extra innings (they carried only 10 pitchers and 15 position players on their World Series roster while the Indians kept 12 pitchers and 13 position players). However, the lightning fast Davis singled and stole second base to lead off the top of the ninth, though he had to hold at third on Brantley's single. With one out, Lindor lined the ball back to Dbacks closer Bradley and it bounced away from him. Davis had to hold at third to avoid teh potential double play and the Dbacks drew the infield in with bases loaded and one out to try to prevent the game-winning run from scoring. Donaldson then hit a grounder past the first baseman to provide the final 4-3 margin, and former Padre Brad Hand recorded the save. 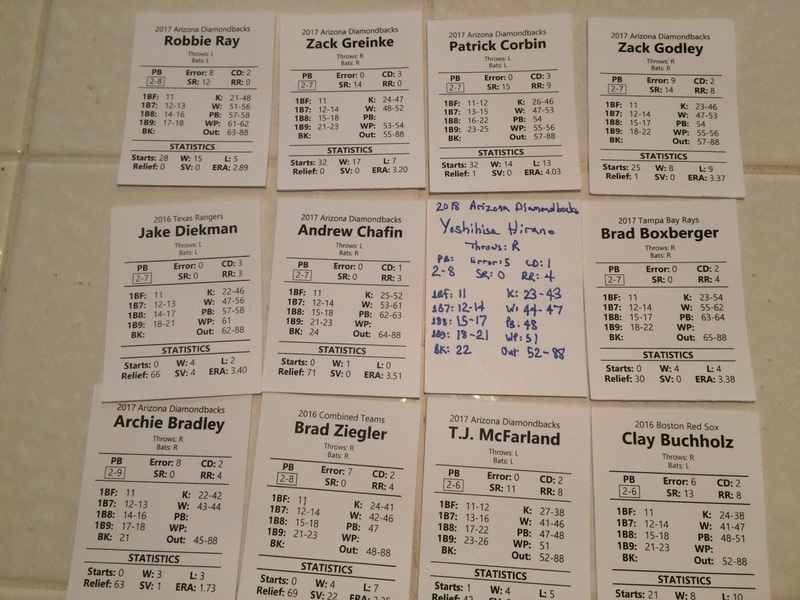 It would take something unusual to beat Corey Kluber. The Arizona Diamondbacks got that in the 5th inning of game 4. Working with a 1-0 lead (Chisenhall solo HR), trouble started with Josh Donaldson's throwing error that set the stage putting runners on 2nd & 3rd with 1 out. AJ Pollock came through with a big 2-run single and two batters later David Peralta added another RBI single and Arizona had 3-1 lead after 5. Those two unearned runs would prove to be the difference. Overshadowed by Kluber, Zach Godley continued his post-season roll as he shut down the Indians for seven innings. He finished his start with 2-runners on with two outs in the 7th, and having to face pinch hitter Edwin Encarnacion. Luckily his hanging curve wasn't hit, and the bullpen took it from there. Godley is now 4-0 in his 6 post-season starts this year. The Indians' tagged Pat Corbin for eight hits but left based loaded in the first and second inning as both bullpens dominated most of the game until Edwin Encarnacion drilled a two-out RBI double in the eights inning as Jason Kipnis raced home from first. After Corbin and Trevor Bauer were knocked out, the two bullpens settled into a great dual - combining for 10 2/3 innings without allowing a hit besides Encarnacion's double. Lindor tripled home Brantley then Donaldson doubled home Lindor in the second to make it 2-0 - but in both the 1st and 2nd inning runners decided to stop at third base on two-out hits. In the bottom of the third, the Diamondbacks jumped on Bauer - the only weaker PB2-6 starter in the World Series based on an off 2017 season - for singles by Avila and Pollock and then a 2-run double by Marte. The Indians have always gone to the pen more quickly with Bauer knowing they are often not needed the next day with Corey Kluber starts - and Olson retired Peralta to keep the game tied. The Indians relief core pitched the minimum 22 batters to get through 6 1/3 innings. The only other baserunner was a walk by Cimber to Descalso in the bottom of the eighth after Encarnacion's go-ahead double, but Hand came in to induce a double play and retire all five he faced for the save. Hirano unfairly took the loss, retiring the first five he faced before walking pinch hitter Kipnis, who then raced around on the double. The Indians can take control if AL Cy Young Award winner Corey Kluber can win Game 4. 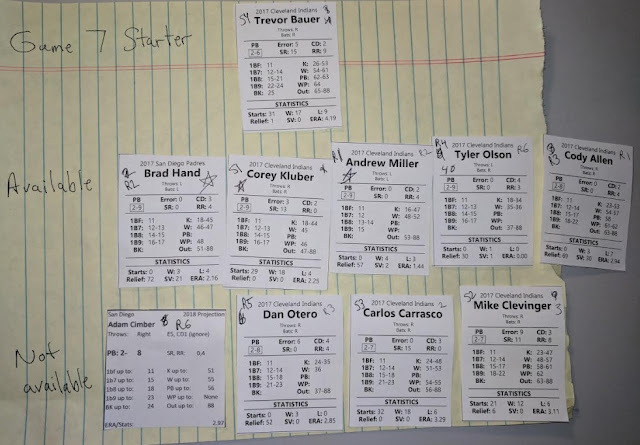 The only two relievers who need to skip that game due to facing more than 5 batter are Hirano for the Diamondbacks and Olson for the Indians. After Game 1 ended with Francisco Lindor getting thrown out of the game to end a frustrating 5-0 loss, Game 2 started with Pollock hitting a homerun to put the Indians in a 1-0 hole. However the Indians know if they can get to the latter innings they have the best Statis-Pro reliever cards in baseball. The Indians started the game with two hits to double their total from Game 1. Later Ramirez took Greinke deep for a 2-run homer to tie the game 3-3 after three innings. 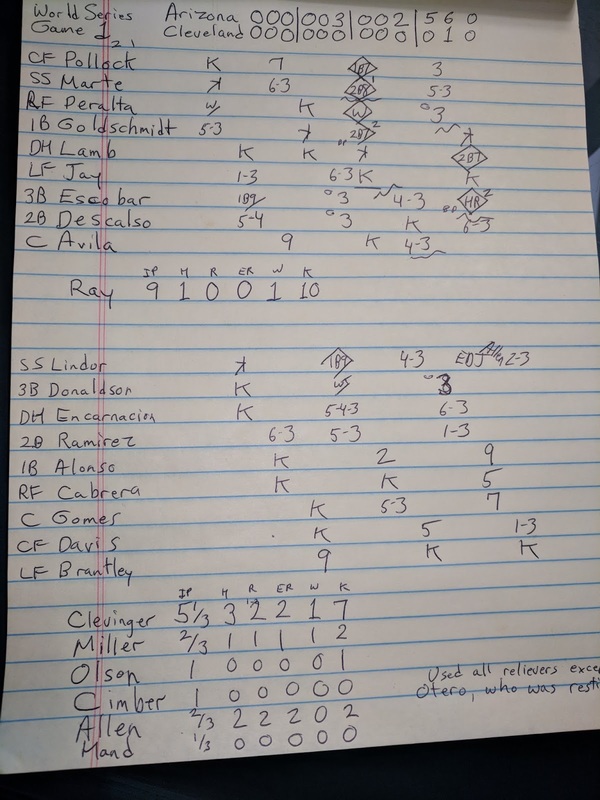 The Indians bull pen was unbelievable as usual, with Tyler Olson coming in with bases loaded no outs in the 6th inning and getting a strikeout and double play grounder to start four hitless innings from the pen. Michael Brantley then through with a 2-out RBI double in 7th to give the Indians a 4-3 win and tie the series one game each. 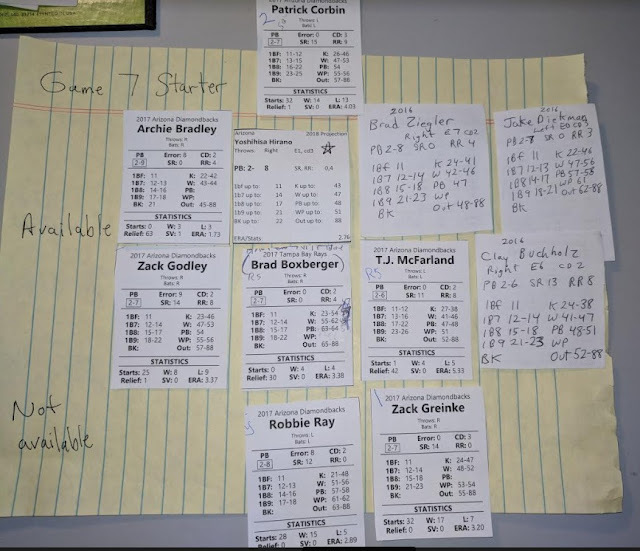 The other option for tracking a Statis-Pro game is to keep marks for players and outs on the board and record results in box score form as below for Game 2. The first game of the 2018 Statis-Pro World Series marks the second straight series in which the Indians were completely shut down by an opposing starter to fall a game behind. In the ALCS the Yankees Severino allowed only two Indians hits in 11 innings (see summary of series here), and September 23 the surprising Arizona Diamondbacks rode a complete game one-hitter by Robbie Roy to a one-game-to-none series lead. The Diamondbacks broke through in the sixth inning when AJ Pollock singled and Ketel Marte doubled him home on a very close play at the plate. The Indians went to Andy Miller, with the best left-handed reliever Statis-Pro card in the AL based on his 2017 stats, but Miller walked David Peralta and then Paul Goldschmidt drilled a clutch 2-run double to make it 3-0. Jake Lamb doubled in the 9th and Eduardo Escobar drilled a clutch home run to provide the final 5-0 margin. The last batter of the game provided excitement as the Indians leadoff man Francisco Lindor, who had the only hit of the game, let the umpire know what the Indians thought of his strikezone and he was ejected, forcing Greg Allen to finish the at-bat. The Indians use a radically different line-up against right-handed pitchers, so will try it again in Game 2. They will face righthander Zack Greinke who was hit hard both in Game 1 and Game 5 of the NLCS (see summary of series here). 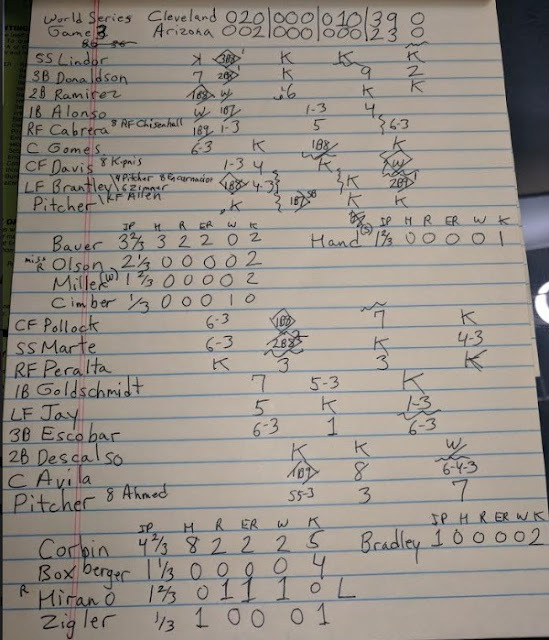 Below is how we record Statis-Pro games - much like a scorebook but we do it on an open pad of paper. 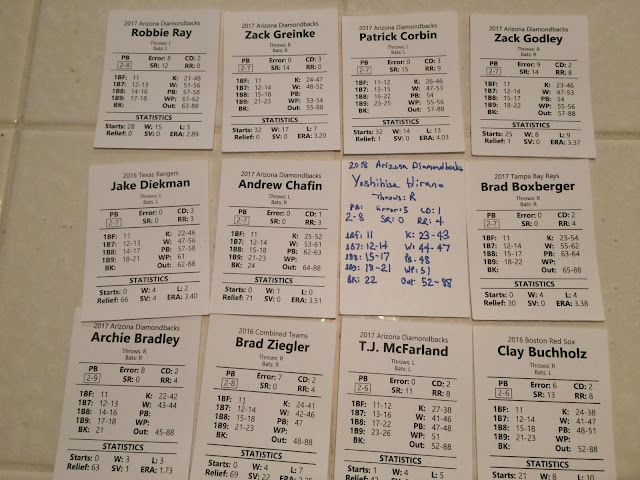 That win could be paramount because if they fall behind 2 games to none they would then face a tough pitching match-up in Game 3 facing lefty Patrick Corbin and throwing Trevor Bauer based on his weaker 2017 stats when he was a mediocre PB2-6. Being pushed to the 7th game by the Yankees means they do not get to throw the best starter in the league - Corey Kluber, until Game 4 (against Zack Godley) and that would likely be his only action of the series except for perhaps an inning in relief if the series went seven games.